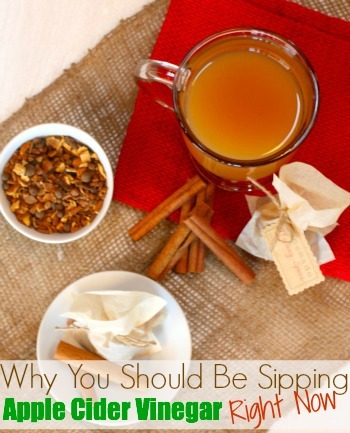 Why YOU Should Be Sipping Apple Cider Vinegar Right Now! Apple Cider Vinegar (ACV) – who would have ever guessed that this natural and fermented liquid could be useful for a myriad of health issues? Over the years, as I have learned more about this natural health aid, I have been amazed at some of the conditions it can be beneficial for. In fact, it is often touted as Mother Nature’s perfect food and is wonderful in helping to maintain the body’s vital acid-alkine balance. Now, the type of Apple Cider Vinegar that I am referring to is the raw, organic, unpasteurized version that still has the “mother” floating in it, such as Bragg Organic Apple Cider Vinegar. Only raw organic apple cider vinegar has the actual “mother of vinegar” that makes this vinegar so beneficial to our health. The “mother” is made up living nutrients and bacteria that you can actually see as they settle in the bottom of the bottle like sediment. The “mother” is believed to have anti-bacterial and anti-fungal properties. What is in ACV to support it’s reputation for health benefits? Calcium – helps create strong bones and teeth. Potassium – helps to prevent brittle teeth and nails, hair loss and sinusitis. Pectin – the fiber that helps to regulate blood pressure and reduce bad cholesterol. Acetic Acid – helps to slow down the digestion of starch which can help to lower the rise in glucose that commonly occurs after meals. Ash – gives ACV its alkaline property which aids your body in maintaining proper pH levels for a healthy alkaline state. Are you ready to see list of potential health benefits of Apple Cider Vinegar? 1. Mix ingredients together in a glass container and sip throughout the day. It is preferable to sip throughout the day, rather than drinking all at once, to help maintain a balanced alkalized state in your body. Always stir before drinking as the “mother” will settle. Note: You can just barely warm this concoction on the stove if you would like to sip it warm, but do NOT allow to boil or even simmer. The point is to keep the Apple Cider Vinegar in the raw state. Since I am the first commenting, I am going to totally call you out. You’ve used that picture before. I remember because I thought the apples and pear look too perfect. Very professional. Anyway, I’ve drink this stuff off and on. But, I’m much more macho. No honey or cinnamon for me. I was drinking it like crazy when we lived at the “house”. Hoping to make me better. I should have known it would be you that would notice I used the same picture again!! That’s why I love you! ACV must always be diluted with water if using it as a beveridge. Full strenth can burn your esophegus. It is acidic! Thanks Ricki! I know that some doctors allow it on the anti-candida diet – my girlfriend was able to use it when she was on the anti-candida diet and she had amazing results with the diet. She is healthier now than she has ever been and she still takes in a teaspoon or two of ACV a day. That’s interesting. I’ve been discovering the health properties of some herbs and spices since I accidentally discovered that tea made of licorice root tea and basil got rid of my lung infections. I’ll have to add raw apple cider vinegar to my list of remedies to buy and try. Thanks! I was just thinking about this the other day and again today! 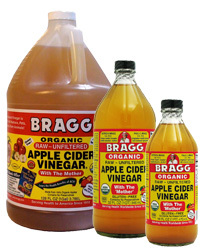 I need to get me some braggs ACV. I was reading the benefits it has on joints as well as for the immune system. Thank you for sharing this one! I will definitely get some this weekend and start drinking up! Funny coincidence….I am sipping it right now before I clicked on your post 🙂 I make ACV Lemonade with about 1 TB ACV, 1-2 TB lemon juice, 1/2 dropper sweetleaf stevia or 1/2-1 TB honey and ice/water. My kids will even drink it this way. So very good for you, gives energy boost and helps with seasonal sinus allergies in our house. Good post! When I was pregnant I craved ACV and would take big swigs from the bottle all the time. I haven’t found any with the mother in though. Thanks for sharing your amazingness with the world..btw, threw some Braggs ACV in the seafood dish I made for the fam last night. DId not even think to add it AFTER cooking to retain the raw. Yet again, you are my hero! Ahh, my sweet sweet neighbor friend. Love you! I drink apple cider vinegar just like you described, Kim, with the filtered water, our bees’ honey, and more often than not cayenne pepper (just a pinch) vs cinnamon. It’s amazingly good and so good for you. as youve shared! Shirley, you are awesome! Thanks for sharing my post! I am going to throw in a dash of cayenne next time. I like that idea! If I had your bees honey here all of the time, I would be in heaven (and even healthier, LOL)!! Awesome! I used to sip it in water every morning, but you’ve inspired me to start again! I had no idea it is so beneficial! Thanks for this Kim! (I’m going to try out your recipe right now). Thanks, Lillian! So glad that you are on the ACV bandwagon. It has even more benefits than I listed, but I thought I should try and not go crazy! Nice informative post – thanks for sharing this. When my son was at his worst earlier in the year, this concoction was suggested for him by a friend. I didn’t know what all the benefits were, but started adding this apple cider vinegar to soups, salad dressings, almost anything I could sneak it into. Can’t wait to try this! I’m a huge fan of Bragg products. I make salad dressings with the bragg amino all the time. Thanks for sharing. I am wondering what it would be that would cause you to feel fatigued from vinegar. Hmmmm. OK I don’t care about reusing photos, especially ones that great. Love the idea of making this into a drink. So what would happen if I added a litte rum or wine to this? I wanted to have some ACV the other day as salad dressing, but I didn’t know if I could have it when I was pregnant since it was unpasturized, is it okay? I hope that helps. I have heard of, and know, many people that have taken this throughout their pregnancy to get rid of the heartburn. I just wish I had known that with my first son when I had terrible heartburn!! Congratulations on your pregnancy! May you enjoy every minute of it. Thanks Kim – I’m going to go home and have some tonight! I have been using ACV for a little over a year now. I wanted to throw a warning out there since I saw you say your mom takes a “shot” every night – you should NEVER drink ACV straight.. it will eat your esophagus and stomach lining up. ALWAYS dilute or at least chase it with liquid/water. One of my first “introductions” to ACV was at an initiation rite of passage into Senior High School. We had to dress up in weird costumes assigned to us by a committee of Grade 12’s, and they put us all through the most horrific tortures all day long. We had to literally bow to the grade 11 and 12’s, call them master and do whatever they said. The first thing I was made to do was drink a pint jar of vinegar!! I thought “They’re not going to beat me!” so I swigged ‘er down while holding my breath. After that, oddly, I liked vinegar dressings, drinks, etc. Then I came across this book by a vet in the N.E. USA who said apple cider vinegar could actually be an antidote to food poisoning! So I drank some whenever I worried if some food was “off”. Never got food poisoning! After all that, I wonder something: Since I also use vinegar to dissolve the calcium deposit build-up in my kettle, could drinking it actually leach calcium from my bones? Anyone know? It is delicious, organic and local. Out of three 5-gallon buckets of apples, I filled 5 wine bottles with the finished vinegar, at NO cost! this after also cooking up 9 0r 10 quarts of applesauce. I picked the apples from my neighbor’s tree, and the scraps became compost after as they would have anyway! Oh my goodness! This is a brilliant idea! I want to do that now!! I am going to read the post. And how lucky are you to be able to pick your neighbor’s apples. We can pick our neighbor’s oranges and grapefruits, but we only make juice with them! 😉 Thanks so much for sharing, Janet! I hate to be the one to post something contrary, but for information sake…i work with a holistic physician and am not allowed to use ACV…upon researching it, I’ve found multiple article like this one below…that talk about the mold risk with apple cider vinegar that makes it not the best choice when it comes to vinegars…..always good to get info and decide for yourself.. I have a question. My husband just found out that he has high blood sugar. we are not working at this time and he needs to get his blood sugar down to get his cdl and get back to work. If i use regular apple cider vinegar and cinnamon to make a drink would it help bring his sugar level down? Also would this help with weight loss? I can’t afford acv or I would try some. Please help me if you can. Not crazy about vinegar, but in this dish apple cider vinegar is absolutely YUM, and comforting. Put red swisschard in pot w/ 1/4 inch water, cubed firm tofu, sliced mushrooms, sliced fresh garlic — place cover, ring to slight boil. Shut off stove, add a bit of olive oil, bit of soy sauce. Ready to serve? Place in a bowl and add 1/4-1/2 teaspoon over the dish. The leftover water – yum – place in cup — put 1/4-1/2 teaspon in cup. Yum, again! I would love to see a recipe for an ACV drink that one could make by the quart and sip throughout the day – – and not all this PC “raw” and esoteric “stuff” everyone insists on pushing. I LOVE Heinz ACV; it is hearty, yummy and just fine. I imagine something like an ACV lemonade drink, wherein one makes a simple syrup base – – maybe with honey, maybe with cane sugar (GMO Free) and adds lemon and ACV to it, maybe store it in the refrig and sip on for days. (Maybe add a bit of strawberry, raspberry or black cherry to this?). Also using tap water or bottled – – where does one EVER find “filtered water” and is it expensive? I have food allergies, but I grew up eating cane sugar cooking, etc. and have seen too many who become ill eating “raw” things. Let’s be safe and happy, and make recipes that are basic, use traditional ingredients that are easily found, inexpensive and available, avoid all the PC trands and don’t contain elusive, expensive and esoteric ingredients. That makes for less stress, happier cooking and baking, and just-plain RELAXING experiences. Just diagnosed with diabetes. Am on BP meds. I drank 2 teaspoons with 8oz water of Braggs Apple Cider Vinegar in the morning and started to feel ill throughout the day. It made may feel dizzy, panic attacks and feeling really tired as if I consumed large amounts of Alcohol. Is this a side effect of drinking it? I wont be in a hurry to try it again as the effects have put me right off it. Apple Cider Vinegar can also act as a detoxifying process in the body as it helps you to remove stored toxins. I would imagine that the effects you were feeling were related to your body trying to remove some of these toxins from your body. If you do ever try it again, I would start then with only about 1/8 teaspoon per day in at least 10 ounces of water. If you can tolerate that, only then would I slowly add more in to your diet. I would add 1/8 teaspoon at a time if you think you could tolerate it. Hope this helps. I just did my shot of ACV. I mix about 5 oz of it with water and down it goes. Another health benefit is that ACV helps dissolve kidney stones. I have used it for this purpose. My last one was big and after a week I remembered ACV. Took a shot and that sucker started moving. I also take it for sinus issues as well. Oops, I meant 5ml not 5oz. I always say that for some reason. I have used Braggs ACV 3 times now and about a 1/2 hr. later I am throwing up. I have been drinking about a quarter or less a cup straight and then chasing it with water. Any suggestions would be appreciated. I tolerate 30mls 3 times a day straight. Is it ok to take acv this way? I find it kèeps intergestion at bay.